Mark Jack returns to his normal Friday slot to offer his analysis and interpretation of another everyday object; this week its the crosswalk. Along the streets we walk, careful not to seem too eager, too nervous, too aware of things. In our several guises—messenger, medic, child, consumer—we hesitate and/or quicken our steps so as to secure our own mobile, personal realms, wherein we might retain some sovereignty, some (it must follow) dignity. As such, an examination of pedestrians on an average, mildly crowded city block—an aerial view—would most likely reveal a random scattering of peoples, as unorganized as could be. There is a general refusal, as we perform our ambulatory theater, to suggest similarities or dialogue. In general, and at various times, as we walk, we fall into soliloquy; soliloquy with no audience but ourselves. But the careful mobility of the unaffiliated walker confronts a simple challenge every 300 feet or so, in the form of cross streets, and the oft-times necessary pause. Suddenly, the dip in the pavement, funnels everyone together. They become anxious, quiet or effusive. Rather than a number of directions, destinations and purposes, the gathering crowd at the crosswalk has a sudden singularity of purpose. Cars stop, or (if not in New York City) make aggressive right turns at reds. Pedestrians collide, walk briskly, or trot if they have the luck of catching the little-white-man walk signal too late, or face the impending wrath of the pulsating orange hand. Everyone becomes aware of others, and to some degree, can know the others’ mind. Waiting for the light to change or for traffic simply to clear, the autonomous nature of the hurried/harried pedestrian confronts communication as recognition. If a car makes a swift, curb-close turn, the communicator must note it and seek confirmation from the other, waiting pedestrians, who might only nod nervously, staring straight ahead or following, with jealousy and offense the criticized car speeding away. Banal subjects like the weather, or Newsweek-esque political critiques get mashed together in fitful, pre-crossing talk. Most people however, stare straight ahead, unwilling to admit to suffering a general, group impotence. At the crosswalk, we speak to dogs, though not—if we can help it—to the humans to whom they are attached. We speak critically of the world while waiting at crosswalks, and speak it conspiratorially. However, once the path is clear across the intersecting street, conversation becomes distraction, and as such, discouraged. Instead of a group of likeminded citizens, ready to criticize the cars, the lights, the city planning commission, the mayor, the achingly anticipated appearance of the footless white man turns all against all, and we spring from the trap to speed across the zebra-ed road and off into our own personal directions. As I walk, I try not to turn or overlap paths with others. However, when I am walking and thinking, I tend to turn and when I turn, I bump and apologize and generally concretize my often flighty, walking thoughts. 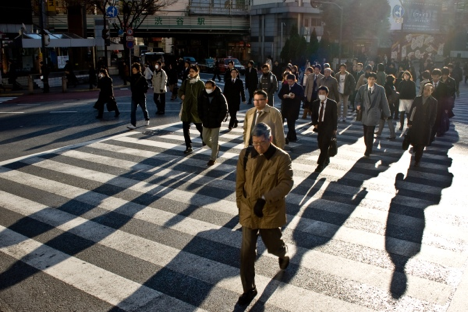 The average city crosswalk contains so many signs of crossing, that diverging mentally from the task of crossing the street is only, at best, a partial affair. The thick white slabs of the zebra crosswalk, the yellow, un-gripping grip zones at the funneling dip as the sidewalk falls to meet the road, all focus attention on the act of crossing the street. All of this I find to be anxiety inducing, and more often than not, if I am out for a leisurely walk I will avoid crossing a busy street if it means I will need to slow down or stop. My love and protection of my individuality as evinced by my private walking and privately thinking through public streets is also a fear that I will lose myself in recognition of my generality. It is a fear that my walk, understood as a reading of the city, of the city as a text, is not unique or private, but something that must, and will eventually be, understood as differently familiar. At crosswalks, the narrowing of walking to the purpose of crossing allows us to view ourselves in others, but it should not be a moment of calm identification, but, rather, a moment of unease, of the uncanny. Calm identification with another is cruel and limiting and false. Unease at recognition is truthful and destabilizing and ultimately, edifying.